ProGReSS’ first documentary about innovation involving marginalised communities is out! The documentary was filmed by our film-maker student from UCLan, Amy Azra Dean, during the same week of the !Khwa ttu workshop, and is now available on our ProGReSS YouTube Channel. The San Peoples of Southern Africa have a wealth of traditional knowledge about medicinal plants. 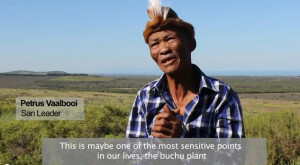 This short documentary filmed in South Africa, features interviews about the buchu plant and its wide range of possible uses to improve health and well-being. The purpose of the film is to show how traditional knowledge holders can collaborate with responsible entrepreneurs and scientists to drive inclusive innovation.